Founded in 1987, with headquarters located in Sharjah and regional offices in Ras Al Khaimah and Sharjah, Five Continents Group is the leading provider of warehouse, material handling, display and office solutions to companies operating in the Middle East and Africa. We strive to build long-term relationships with our clients by providing them with innovative solutions, comprised of knowledge, technology, equipment and training, that deliver real benefits to their operations and their earnings. To enable us fulfill this promise we’ve got a full-fledged well equipped office facility in Sharjah Industrial Area 2 to monitor and take care of the business volume efficiently and extend excellent services to our valued customers. 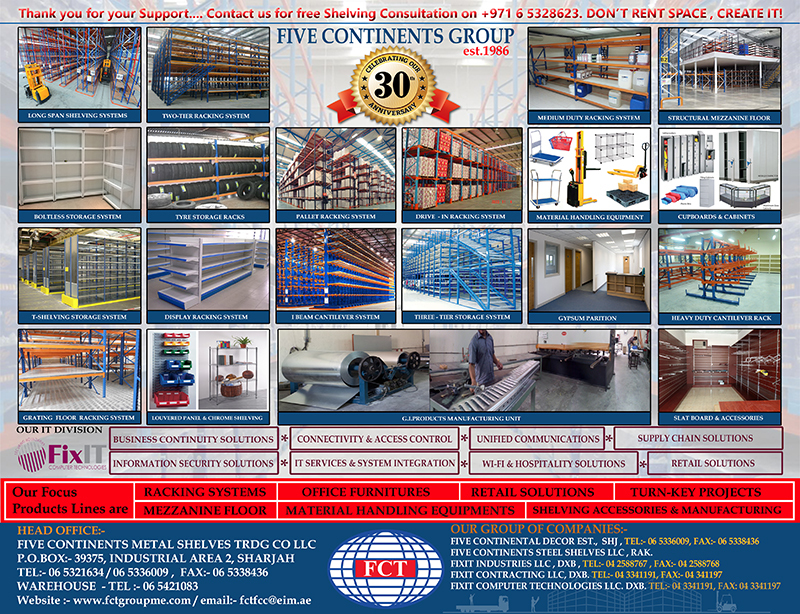 Five Continents – A unique solution provider for any kind of shelving requirements, in its own way. At Five Continents we redefine your space. Five Continents – emphasizes on quality products catering for today’s competitive and demanding business environment. Using advantage technology supplement with stringent quality control systems, we ensure that our suppliers meet our high production standards. Furthermore, with depth knowledge of our racking system capabilities, our products have achieved very high quality standard in this industry.